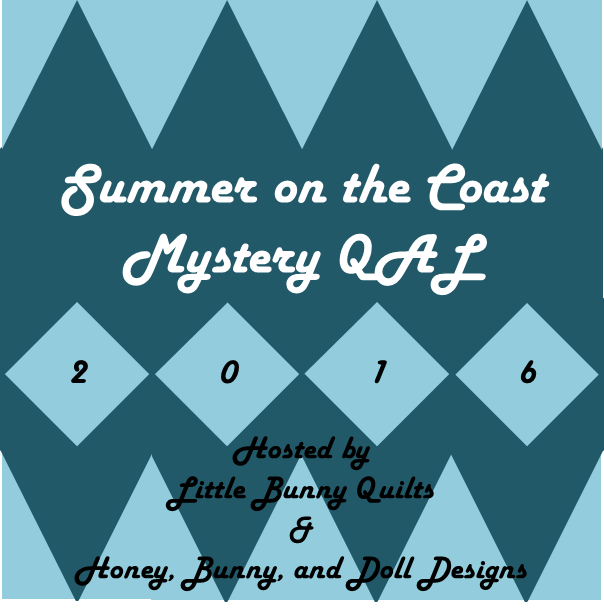 It's coming... 2016 LBQ Mystery Quilt! 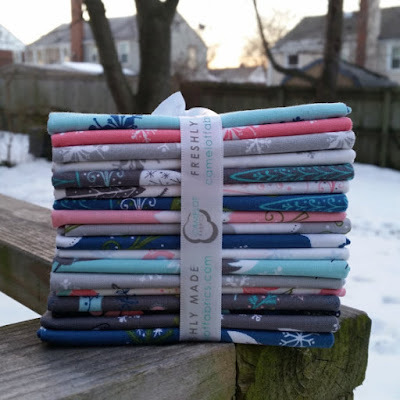 I'm excited to announce that in March I will be kicking off my fourth QAL! 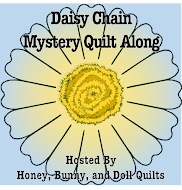 A long while back, I asked you readers what you liked in a QAL -- and there was a lot of interest in mystery quilts as well as paper piecing. 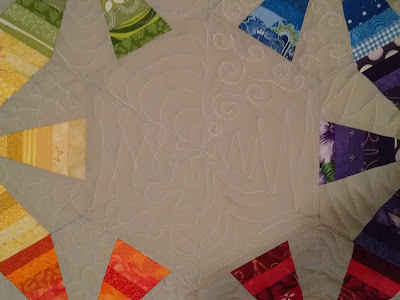 I did the most reasonable thing and came up with a completely paper pieced mystery quilt! 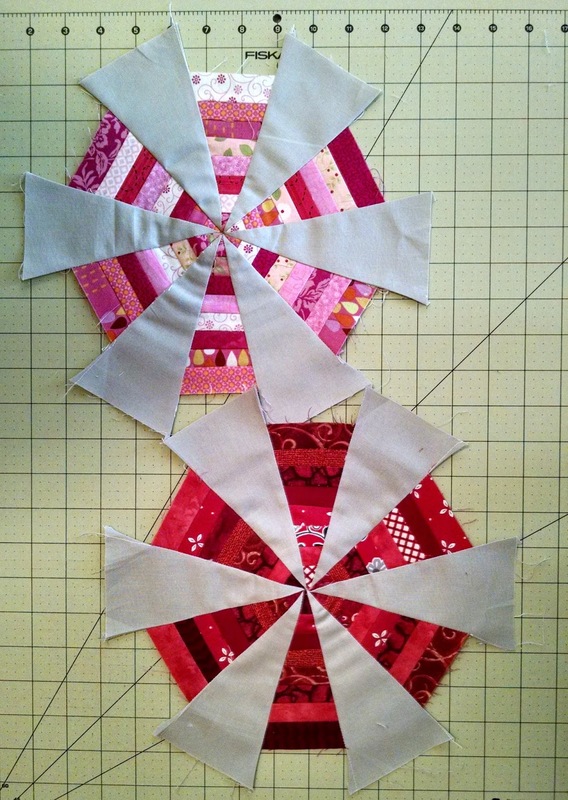 This is going to be short and simple -- there are only three different blocks in the quilt! Directions will typically be posted the first Tuesday of each month other than in March when we discuss yardage and fabric selection. This quilt along is going to be short and simple -- there are only three different blocks we will be making for this quilt. 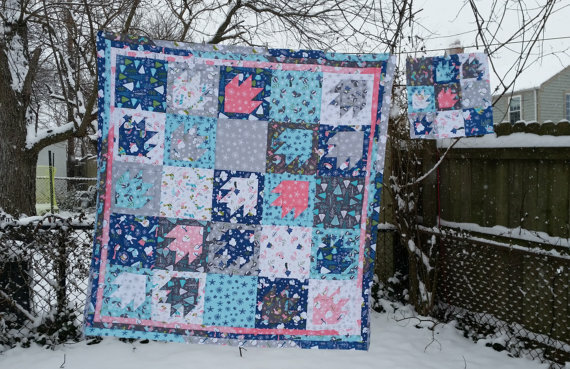 There will be three different quilt sizes addressed in the quilt along (baby, throw, and twin) and I am planning to have a queen size option added by the time the full pattern is released. 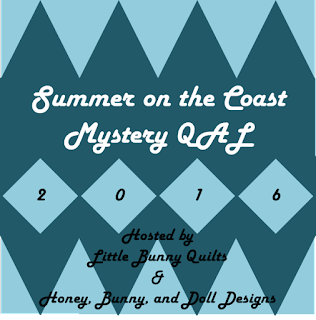 Additionally, this QAL will end before the summer is over, so it won't be a long term commitment to participate! If you are a beginning paper piecer, this is going to be a great way to practice your foundation paper piecing skills as the blocks are very simple and decently sized. We'll be doing basic shapes and units and I'll be giving lots of tips and tricks on all aspects of paper piecing. Are you ready to join in? Start eyeing those stashes -- the fabric requirements and fabric choice suggestions will be up next week on Tuesday! Last night I was able to get all but 18 inches of the binding for this quilt done and I finished it up this morning (pre-coffee!). Introducing Blue Breeze! This quilt is for my former boss who is having her first baby in March! Little boy will be here in just a few weeks! I used the Summer Breeze pattern from Scrap Basket Surprises but didn't add the borders around the sides. 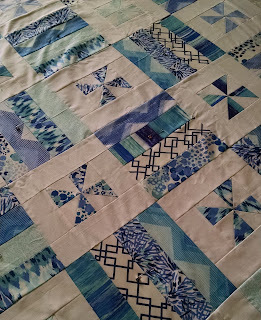 I quilted this one with a large meander in white and used aqua for the backing. For the binding I used a solid blue fat quarter and turned it into 2" double fold bias binding. I usually use 2.25 or 2.5 inch binding, but I had to go slightly skinnier because otherwise I would have been short on my binding. I machine stitched it to the front and hand stitched the binding to the back and now it is ready to go to its new home! So somehow I have three baby quilts going right now. How did that happen? I might have to go to the store to get some binding fabric for this one since I used all of the jelly roll strips I had in the top. I'm thinking cobalt blue -- what do you think? And I started a Jelly Roll Jam 2 baby quilt (using fat quarters instead of a jelly roll) and here are all of the blocks laid out! This was very fun, fast, and easy -- and I had to cut all of my 2.5 inch strips too! I've also been working on my pink and brown version of the Bear Tracks pattern but to this point all I have done is cutting. Hopefully next week I'll have blocks (and maybe a top!) to show -- especially since the baby this one is for is due in two weeks! Eek! In other news, I'm excited to share that today is my last day at my current job and I start my new job on Monday! I'll be working closer to home (hooray!) and will be going back into the lab working with nanoparticles (which is what I did in graduate school) and I am very excited about the change! It's always hard to close one chapter and start another, but it is definitely time for a change and a move up! 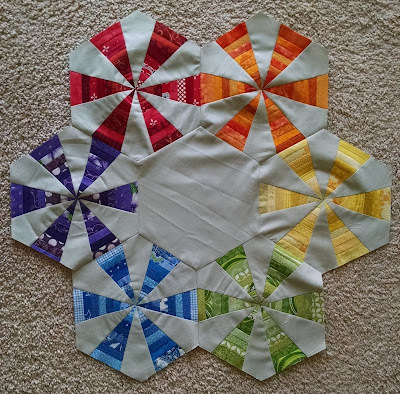 I was thinking originally I would do eight giant hexies -- red, orange, yellow, green, teal, blue, purple, and pink. But then I realized that would be slightly too large, I decided to go with just red, orange, yellow, green, blue and purple. This was actually surprisingly simple to put together. From the first picture, I trimmed off the extra grey so that each one became a true hexie and then sewed them all together in rainbow order around a center plain grey hexie. Here's the mini quilted. It's hard to see the quilting in the first picture, but easier to see in the close up of the center. Now I need to decide how to finish it and add a sleeve. 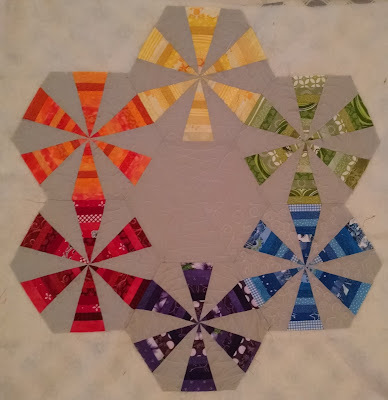 I'm not sure if I should add more grey fabric around the edges to make it square or a large hexie, or if I should leave it with all of the corners. I like it as is and think I can easily bind it as is, but I am not sure what my partner would like! She's been silent on Instagram so I'm slightly concerned. Sharing at the normal places! Bear Tracks Pattern Premiere and Giveaway! I am so excited to share Honey, Bunny, and Doll's newest pattern with you today -- Bear Tracks! 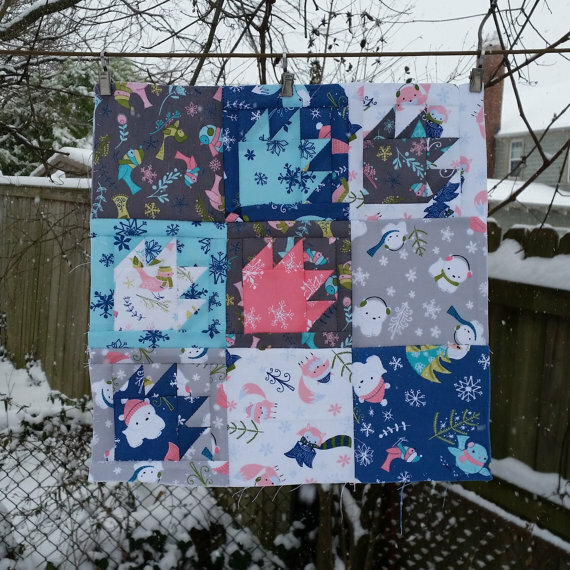 This quilt is made in Heather Rosas' Winter Wonderland line! This fabric is absolutely adorable! Perfect inspiration in the midst of all of the snow we've gotten in the DC area lately! We also just posted this pattern and fabric as a quilt kit on Etsy! The kit includes the pattern, fat quarter bundle, and the backing -- all for $70! This is our first pattern that includes a pattern for its mini version -- and you don't have to buy it separately! Not only that, but you can make both the wall hanging/throw quilt AND the mini quilt from one quilt kit! Click over to Etsy to purchase your own kit! So how about a giveaway for a copy of the pattern? 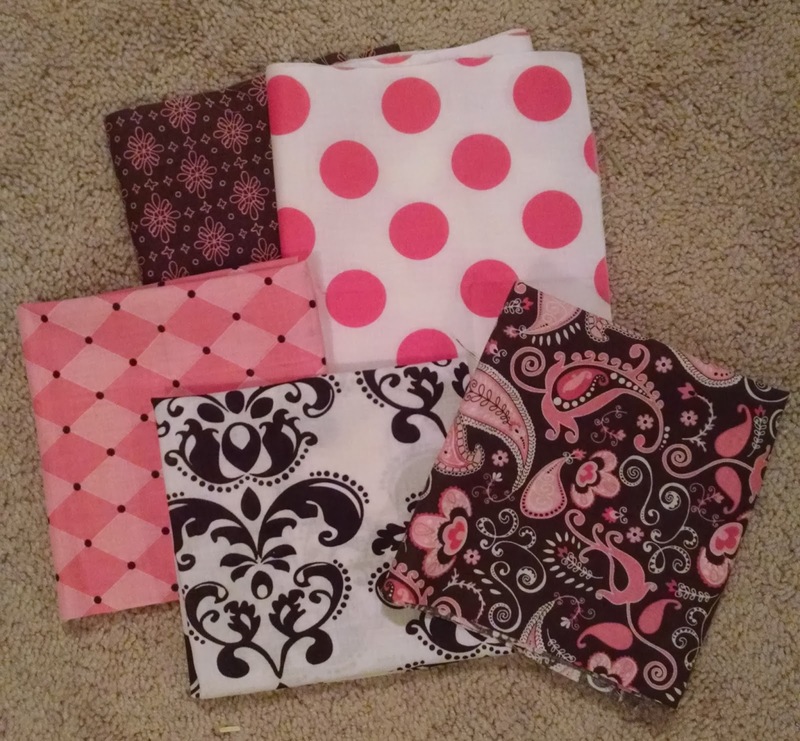 Leave me a comment with what fabric line you would use to make your own version of the Bear Tracks quilt! Winner will be announced on Monday! As always, don't forget to follow Honey, Bunny, and Doll on Facebook for flash sales and pattern premieres! Update: the giveaway is now closed and Cecilia is the winner! 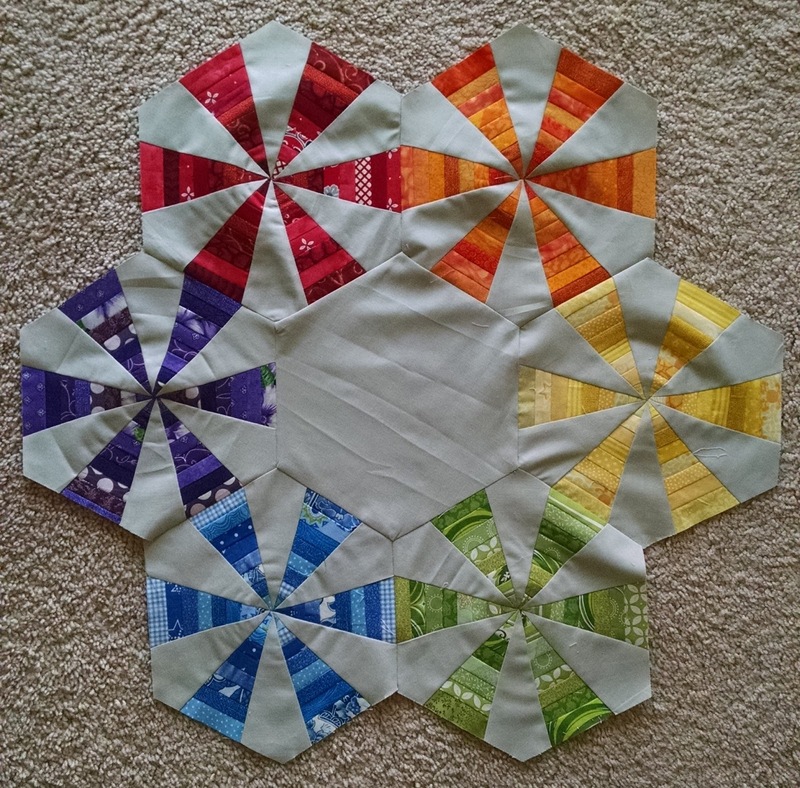 I've finished up my Rainbow Scrap Challenge blocks for February -- hooray! These were a treat to make in sweet Valentine's day colors of chocolate and strawberry. Now to wait a few more weeks until the March color is revealed! I hope everyone had a wonderful Valentine's Day with their sweeties! Don't forget to enter the Bear Tracks pattern giveaway! 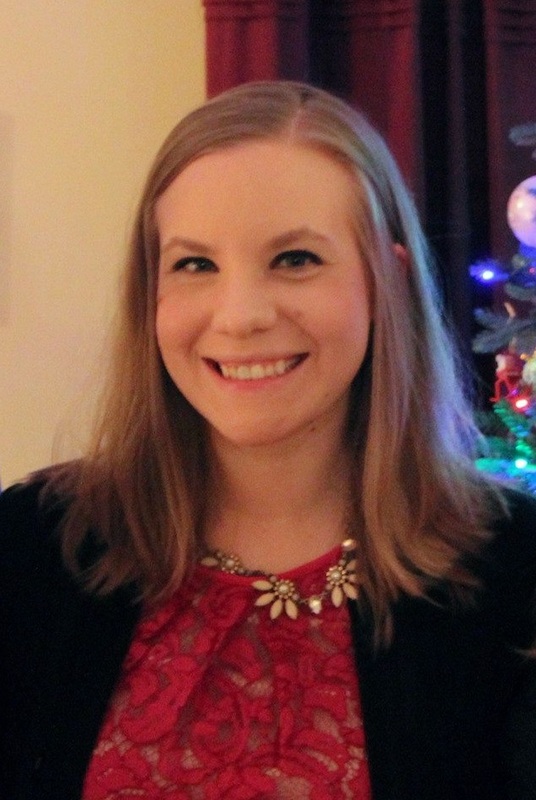 This month in the Stash Bee, my friend Heather is Queen Bee for my hive. She requested scrappy trip around the world blocks with navy and mustard as the center colors. Now, for some reason, I really struggled with this block and basically threw a half completed block into the "project abyss" because it wasn't cut straight. My second try turned out just about perfect so I'm not sure what happened the first time around. After making this one successfully, I can definitely see why people love these blocks for scrap and strip busting! I am waiting on one more pineapple to arrive to me and then I will show you all of my fruits! Oh Fudge Tutorial and Giveaway! The giveaway is now closed! Thanks to all who participated! See who won below! Today I am sharing a "sweet" tutorial over at the Benartex blog Sew in Love with Fabric as a part of their Oh Fudge hop to celebrate Valentine's Day. This table runner is made with fabric from the Oh Fudge 10 x 10 inch stacker! 1. Leave me a comment with what you would want your sweetie to bring you on Valentine's Day. 2. Followers via any platform get a second entry -- lots of following options on the right sidebar! Just tell me how you follow! Pop over to Sew in Love with Fabric to check out the tutorial! Update: Our winner is Kathy! 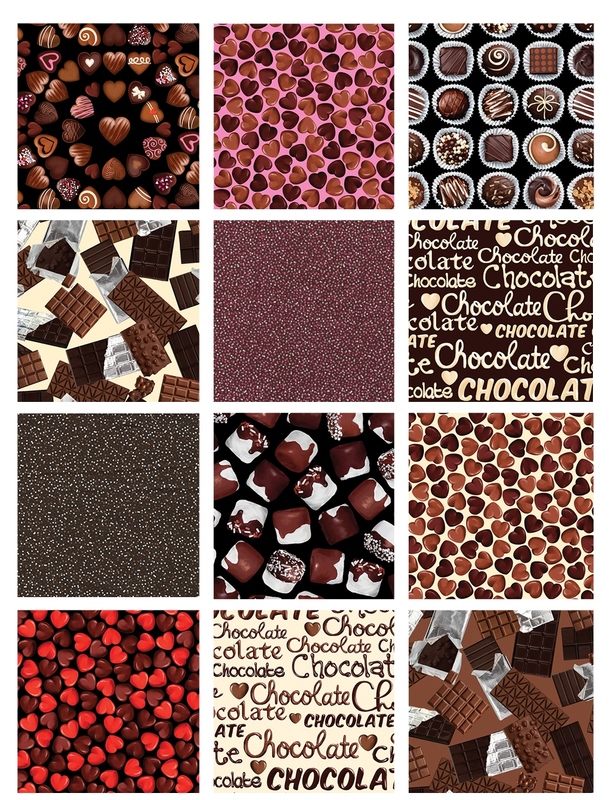 This weekend I made a big dent in my "chocolate covered strawberry" blocks for this month's Rainbow Scrap challenge. 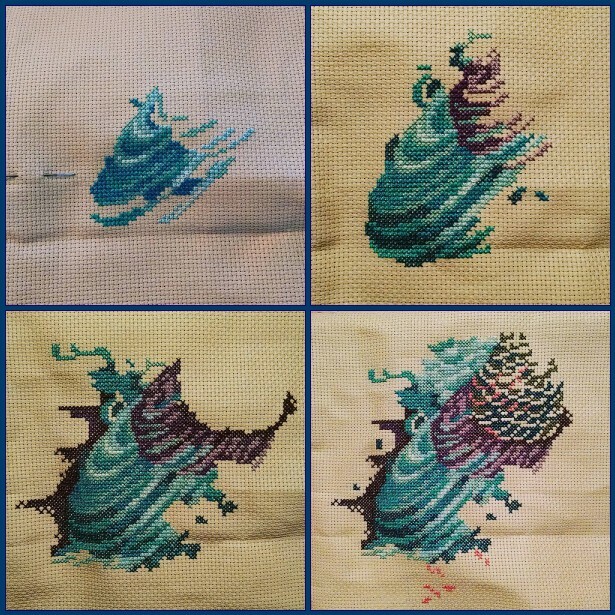 Of the six I finished this weekend, the top three were traditionally pieced and the bottom three were paper pieced. All of these have a touch of pink and I am happy with the dent I have made in my brown scraps! I don't think I'll be able to cut my brown scraps by half like I did with my blues last month, but any scrap busting is progress to me! 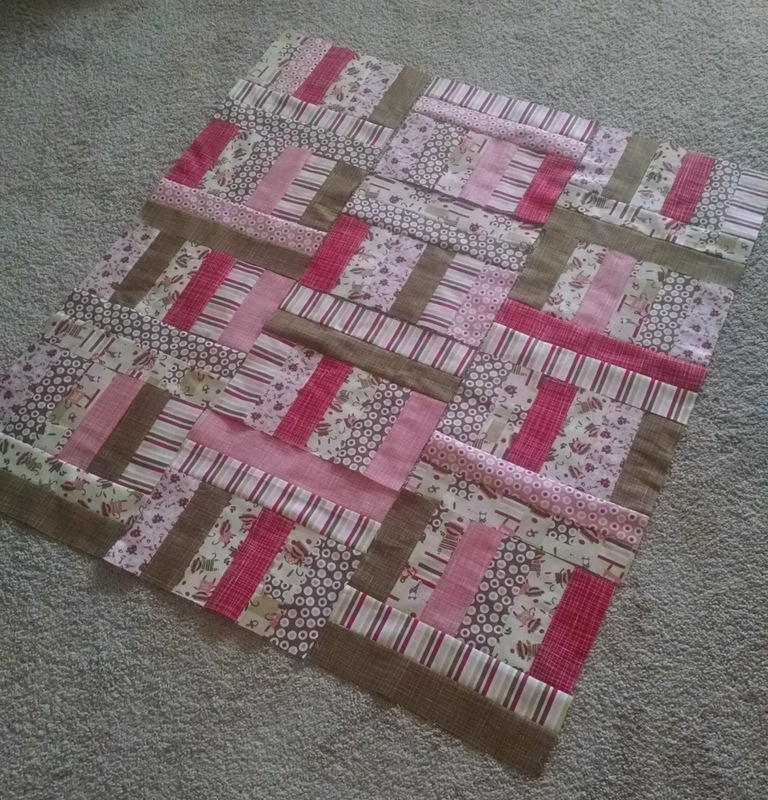 I think my favorite block out of these eight is the checkerboard block because I was able to use eight different small brown scraps in the squares. Which is your favorite thus far? I am working from home today because we are getting MORE snow. This makes me more and more excited for the trip we just booked to Arizona in March! Anyone else getting hit by more snow this week? 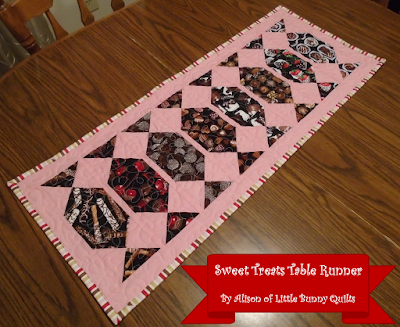 Sharing at Sew Cute Tuesday, Linky Tuesday, Fabric Tuesday, and Scrap Happy Saturday! This month in the 2016 Rainbow Scrap Challenge our color is brown with pink accents -- that is perfect for February and Valentine's Day! 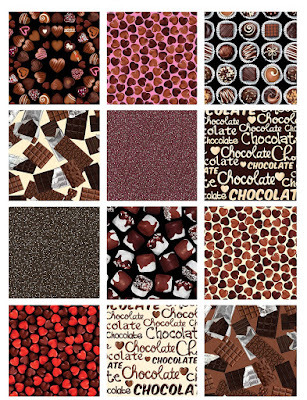 It makes me think about chocolate covered strawberries! This is actually more than I thought I had, so hopefully I will make a big dent in this! 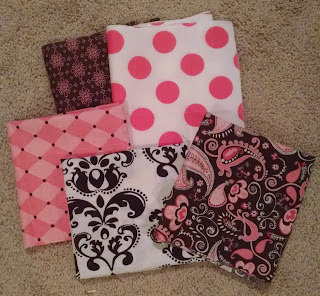 Here are my fabrics sorted into light, medium, and dark with my pink accent pile pulled too. This month I'm making blocks 12-22 of the 1920s Farmer's Wife blocks. Unlike January where I only paper pieced one of the blocks, since a good chunk of these have odd angles or are set on point, I plan to paper piece the majority of these blocks this month. 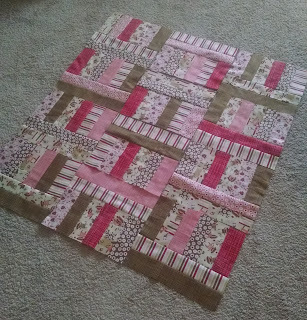 I think adding the pink in keeps the brown from being too drab, and I am planning to use more pink this month as an accent than I did last month with the purple accents in the blue blocks. These turned out so cute! The pink is a great accent. The one on the left is cut and pieced as normal, and the one on the right uses the paper piecing patterns and it turned out great! Now on to making more of these! Linking up at Scrap Happy Saturday! Since then things have gone a little slower since, you know, I had to go back to work and be a responsible adult and not sit on the couch and sew most of the day. Here's what it looked like last night. 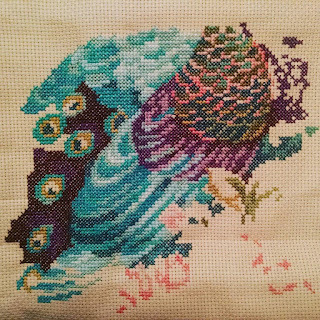 The next step will be continuing with the flowers (the peach areas scattered around the bottom) and the neck of the bird.